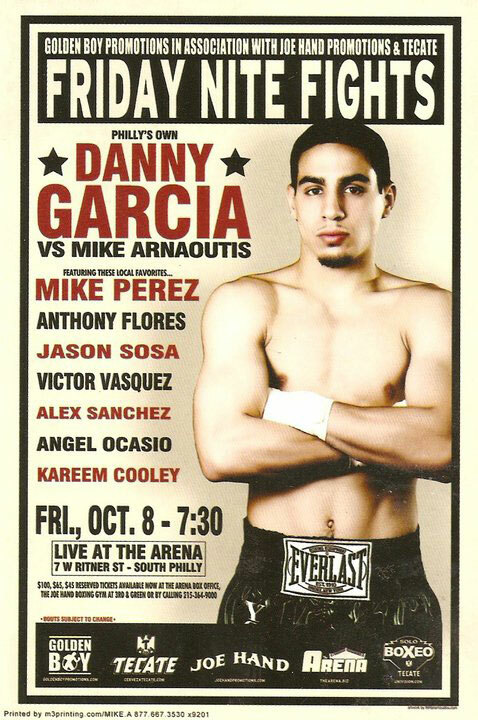 Solid gold Philly prospect Danny "Swift" Garcia made it 19 in a row Friday night (10/08/10) at the South Philly Arena with a 4th round knockout of experienced southpaw Mike Arnaoutis. Garcia used a potent left hook to drop Arnaoutis near the end of round 3. Arnaoutis got up but toppled a second time as the bell rang to end the round. He beat the count, and returned to the action in round 4. However, a set up right and another brutal left hook brought the evening to a close. It was Garcia's 13th KO in 19 wins, and bolstered his claim as the best prospect in Philly. Arnaoutis lost his 4th straight, falling to 22-7-2 / 10 KOs. Lightweight Victor Vasquez (12-4-1 / 6 KO) dropped Bryne Green in the first round, and used that extra point on the scorecards to squeak out a six-round split decision (57-56, 57-56 & 56-57). Arash Usmanee shocked rising Anthony Flores with a comfortable unanimous decision in their 8-round jr. lightweight bout. Usmanee improved to 9-0; Flores dropped to 9-2-1. Kareem Cooley (2-1) rebounded from a prior loss to take a 4-round decision over Eluid Torres (3-2-2). Bastie Samir (5-0 / 5 KO) battered Philly's Joe Dunn (0-2), stopping him in round two. Newark's Wanzell Ellison (3-0) topped Aaron Anderson (1-8) with a four round shutout decision. The card was promoted by Golden Boy and televised by Telefutura.